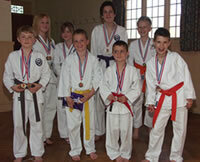 The Burwell Karate Association held their annual junior karate competition on Sunday 15th April 2007 at the Gardiner Memorial Hall in Burwell. Medals were awarded for both Kata (sequence of set moves) and Kumite (fighting). Great fighting spirit and ability was shown by all who took part and the level of Karate was some of the highest the club has seen. Max Baker and Matthew Clarke were both awarded medals for fighting spirit. There was also an award for best technique which was given to Sam Andrews. Senseis Jason Andrews and Steven Andrews oversaw the event and would like to thank everyone who took part. The BKA train on Sunday mornings at the Gardiner Memorial Hall Burwell and Tuesday evenings at the Burwell Primary School. They also train Thursday evenings at the C of E infant school Cherry Hinton Cambridge. If anybody would like further information please contact Sensei Jason Andrews 07734088452 or Richard Crockford 01638 742791.